The Shivgad Tanda (hamlet) is a remote hilly area in Paithan Block of Aurangabad district. The hamlet comes under the Adul Gram Panchayat (local village body) which is 5 kms from the hamlet. This village has been selected for the natural resource management activities since May 2006 by WOTR. The NRM interventions would improve the degraded environment, increase in-situ soil moisture and infiltration. A total of 58 students (girls 28, boys 30) will get benefit from this activity. t is difficult to mention the exact number of people getting the sanitation. An approx. number is mentioned on the basis of discussions with the villagers. This village has been selected for the watershed development programme since May 2005 by WOTR. The women members of the SHGs and SMS have taken initiative to design the drinking water project through Participatory Rural Appraisal (PRA). 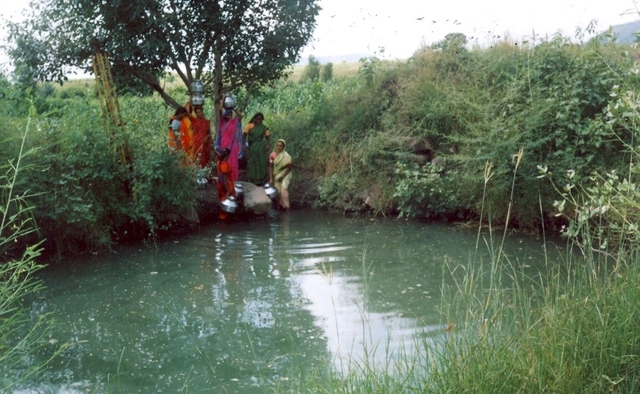 The women and village community have identified a permanent source i.e. a percolation tank of water at a distance of 345 meters from the village. It is planned that a new well will be dug. The location of the proposed well is in the field of Mr. Hiralal Rathod, who has donated an area of 2000 sq. ft. to the village community for implementation of the activity. A water storage tank would be constructed having a capacity of 15,000 liters of water. The water will be lifted and stored at the newly constructed storage-tank at the strategic location and the water will be supplied through 345 meters of pipeline to the 5 stand posts which would be constructed. The Gram Panchayat has given no objection letter to this effect. It is proposed to use one set of 2 horse power submersible pumpset to lift the water. - The inhabitants living in the hamlet are Nomadic tribes and their settlement is in the interior and remote area which is at a distance of 5 - 6km from the main village. - The identified assured water source (percolation tank) is at a distance of 345 meters which is away from the hamlet and there is no other source of water nearby. Due the distance, the main pipeline costs (estimated) has increased. - This community comprises a total of 32 households and 178 inhabitants. - Due to the remoteness of the hamlet no government schemes have been implemented and the area has been neglected by the developmental agencies. So though the per person costs of the project exceeds, we propose that the community should be supported to solve their drinking water problem. Implementing Organization: The implementer NGOs name is SURABHI. How does the community get sanitation from this project? Is it not purely for drinking water?? If they use the water for sanitation too, 15.000 Liters will probably not be enough to carry them through the dry season. Thank you for the feedback and the appreciation for the project. Ã¢â‚¬Â¢The primary focus of the project is to provide clean and safe drinking water to the village community as there is an actue drinking water shortage specially during the summer months. Ã¢â‚¬Â¢ Simultaneously, efforts are taken to educate the village community for preventive health care (personal cleanliness and hygiene, surrounding cleanliness, immunization etc). Ã¢â‚¬Â¢During the SHG/SMS meetings, besides the financial matters other issues such as womenÃ¢â‚¬â„¢s drudgery, health, sanitation etc are also discussed. A trained and experienced lady social worker has been appointed to promote the womenÃ¢â‚¬â„¢s developmental activities as well more focus is given on the health education and hygiene and preventive health care. The women are sensitized in key hygiene issue such as washing of hands with soap before eating and cooking- after use of toilet, cutting the nails, and inculcating hygienic habits in the children. Ã¢â‚¬Â¢The local woman health promoter has also been trained to impart information/knowledge of the preventive health care in the village. (ii) Probably 15,000 ltrs will not be enough Ã¢â‚¬Â¦. The population of the village as per survey is 32 (families)/178 (population). Projected growth of population for the next 20 years considering @10% increase in population estimated is 196 inhabitants. Ã¢â‚¬Â¢ For livestock : 4170 liters per day. For small ruminants (goat, sheep etc.) 1920 liters is estimated @10lts/ per day. Total water requirement per day is 13,970 liters per day round up to 15,000 liters per day. What is the annual or monthly average income of these nomadic tribes? Do they have cash income or do they live by barter of animals and crops? How many hours per day will the pump have to pump in order to fill that 15,000 liter tank even once per day? How much per kilowatt hour does the electricity cost there? how much per family then will the pumping cost? Who is the technician to maintain and repair the submersible pumps? What is the long-range replacement plan for when the pumps wear out? 1. Average income of Nomadic tribes: The total geographical area of the hamlet is 125 ha. out of which 110 ha. is cultivable. The average land holding size is 3.43 ha. per family. The main occupation is farming. Usually in a year, they take 2 food grain crops and cotton as a cash crop. Generally they are engaged in agriculture activities for 6 months and remaining months they work as labourers in state/national employment guarantee scheme. Their average monthly income is around US$ 45 to US$ 55 (yearly US$5540 to US$ 666). The barter system is not in practice here. 2. As per the technical design of the project, one set of 2 horse power submersible pump set to a discharge of 2 LPS (Litres per second) for the gross head of 50 meters of 62.5 mm x 4 kgs sq.cm HDPE pipe is proposed. Thus, it will take approx. 2 hours and 5 minutes to fill up the storage tank of 15000 capacity per day. 3. There are different rates for different use of electricity. e.g. Domestic use, industrial purpose, agriculture purpose, urban drinking water schemes and rural drinking water schemes. The rates of the rural drinking water scheme is subsidized i.e. Rs. 125/- (US$ 2.77) per horse power per month is being charged irrespective of electric consumption. 5. Incase of the damage of the electric machine, the villagers would be responsible for its repairing. Also one person from the village would be appointed as a pump operator on a monthly remuneration of US$ 11.11. He would be trained for the maintenance and will be responsible for day to day operation of the pump. Incase of major repairs the said motor would be given for repair to a technician available in the main village. 6. Regarding the long term replacement plan - As explained in the maintenance revenue model, a provision of reserved fund has been made. The operational cost for the maintenance of the water supply project and the electricity bill will be collected from each family per month. The reserved funds will be used for the replacement of electric pump set and major repairs, valves etc after every 7 years so as to make the operation more effective and efficient. I have read everything in the Organization Description and the web page of Watershed Organization Trust and I find that the two projects listed as prior projects of the organization are dated 2006 and that there is only one reference on the webpage to water or san development, a series of school wells and latrines. It appears that the organization is devoted to training for watershed management, not water project development. I cannot find out who is the actual project operator of either of the projects listed in the organization info page, or the proposed project. Who will actually execute this Shivgad Tanda project? It appears that the directors of WOT are specialists in human resources, training, and planning, and are not water project operators, engineers, or technicians with water experience. Do you contract with a local NGO, company, or individual to carry out projects, such as the Shivgad Tanda project? If so, please provide the experience and capacity of the actual project operator. Though the main focus areas of WOTR are capacity building of village groups and NGOs for participatory watershed development and self help promotion, but at the same time WOTR also undertakes direct implementation of watershed projects. So far, we have implemented 66 watershed projects covering an area of 48426 ha. in Maharashtra state and 17 project in the state of Andhra Pradesh covering an area of 8429 ha. WOTR has 6 regional resource centres in different parts of Maharashtra and 2 resource centres in other states of India i.e. in Madhya Pradesh and Andhra Pradesh. Besides these resource centres, WOTR has 6 implementation units in different areas. WOTR has 24 technical staff i.e. Civil/Agril Engg. and 38 qualified community organizers / lady social workers. 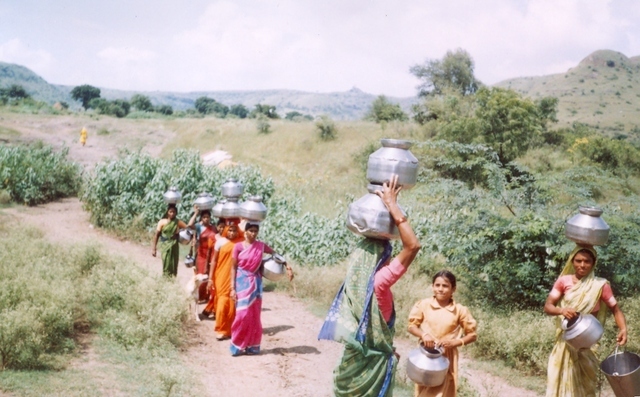 The Project titled Ã¢â‚¬Å“Capacity Building through NGOs for Watershed Development, Maharashtra: Poverty Alleviation through Community ActionÃ¢â‚¬Â (CAPA) was implemented by WOTR during the period September 2002 Ã¢â‚¬â€œ May 2003. Under the project various watershed development activities were implemented one of which was that reduced the drudgery of women and improved living conditions. Activities related to drinking water, privacy, sanitation and hygiene and use of clean fuels and energy saving devices was also implemented. Because of the severe drought situation, addressing the drinking water problem was the most demanded activity and 40 villages benefited from this activity. 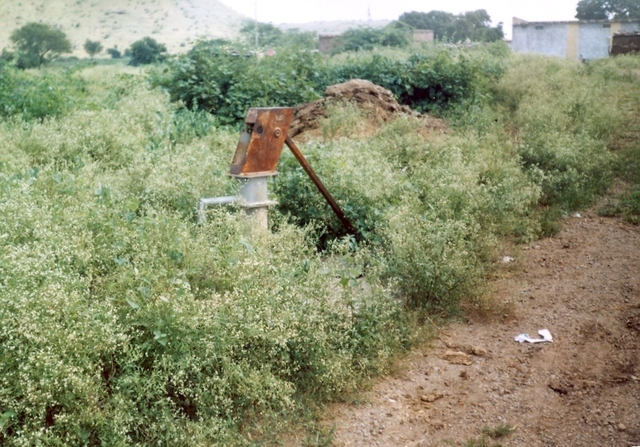 In 4 villages the common well was deepened. In 22 villages bore wells / open wells were dug and pipelines were installed and in 24 villages water tanks were constructed and connected to a water source. In 24 villages the SMS took the initiative and saw the activity through completion. In 16 villages the SMS jointly with the VWC were the implementers. In these villages the SMS or the VWC jointly with the SMS have undertaken responsibility for the post project management. WOTR also implements drinking water project including sanitation activity in its project villages under the women's drudgery reduction activities. Besides the above mentioned drinking water project, so far WOTR has successfully completed 3 drinking water projects and 2 project are nearly to be completed under BPR. WOTR has sufficient experience and qualified technical staff to implement the project. WOTR also provides financial and technical support to the local partner NGOs to implement the watershed development activities in different areas. For. e.g. The local NGO SURABHI is being supported by WOTR for the implementation of the 'Honabachi Wadi' watershed project. The drinking water project from the same village as well as from the neighbouring village i.e. Shivgad Tanda have been selected by WOTR to be implemented by the partner NGOs only. SURABHI has degree holder civil engg. with 5 years experience as well as a qualified and experienced lady social worker who is supported by WOTR to implement this drinking water project. Besides this WOTR also provides technical support and monitors the activities from its Regional resource centre which is located in the Aurangabad region at about 50 km distant from the proposed drinking water villages.